Dan Ticktum (Motopark) and Enaam Ahmed (Hitech) are the winners of three races of the Formula 3 European Championship at Hungaroring, the second round of the 2018 season. Ticktum was the race winner on Saturday while Ahned won both races on Sunday. 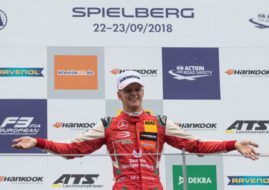 On Saturday, Dan Ticktum converted pole position into his maiden F3 European Championship victory, defeating four Prema Theodore Racing’s drivers – Guan Yu Zhou, Robert Shwartzman, Mick Schumacher and Ralf Aron. Initially, Ralf Aron was in the second place but he received five-second penalty due to jump start and dropped from P2 to P5. In Sunday morning’s Race 2, Enaam Ahmed did the same as Ticktum in the first race – clinched his maiden F3 European Championship victory. Ticktum was on pole position again but he had to retire early in the race due to mechanical issues. Prema Theodore Racing had its representative on a podium again. This time, that was Marcus Armstrong. Another Hitech driver Alex Palou finished in the third place. On Sunday afternoon, Enaam Ahmed concluced his fantastic weekend with one more victory in the race which he started from pole. Dan Ticktum added plenty of points to his account by finishing second while Mick Schumacher secured one more podium for Prema Theodore Racing and his first podium this season. Two wins put Enaam Amhed on the top of the championship standings after six races. He has 83 points, eighteen more than Guan Yu Zhou and twenty more than Dan Ticktum. The next round of the F3 European Championship would be again a part of DTM weekend, on June 23-24 at Norisring.